Gutters and Downspouts are more than just a way to keep rainwater from slapping you in the face at your front door. Gutters and downspouts also protect your home by diverting flooding rain away from your foundation, walkways, porches, entries, and safely into the storm water system and drainage paths where it should be going. When you look at the front of your house, one of the details that may be making it look dingy and out-of-date are the gutters. Sometimes that can be cleaned and polished back to “new” condition with a simple swipe of a common foaming cleaner. Many times, cleaning is not enough. Some gutter systems were made of cheap materials, even plastic, that snapped together and then eventually snapped apart. Now they may even be leaking. Or perhaps they were painted which is often a fatal mistake as they will seldom look good after their factory finish has been brushed over. 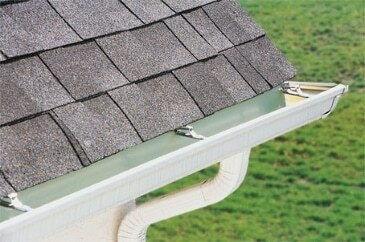 Get continuous gutters, milled in a single section right at your home. We will offer you dozens of subtle colors that will blend in with your home’s shutters, or front door, shingle colors, etc. Your new gutters and downspouts are going to match your home and take years off of its appearance! We are then going to make recommendations based on your roof size and shape that will handle the typical downpours we face here in the Carolinas. Many gutters are just too small; same with downspouts. We may suggest that you add just an extra inch in width to these waterways and the results will amaze you. Often called “commercial”-sized, a slightly larger gutter can handle much more rain falling in a short period. Your preferred Charlotte Gutter Contractor offers Charlotte’s Best Gutters ’s installer and recruited him to our team. We located the best materials and manufacturers… those with the best reputation and warranty. We insist on the level of customer service that our roofing and light construction teams are now famous for – we treat each project like it was for a member of the family. And finally, if nearby trees and foliage are keeping you on the dangerous end of a ladder too often, then we will look at gutter guards. Climbing on ladders for household chores is the number one source of accidents in the home. If you ever fall off a ladder, you’re likely to regret it for a long time.